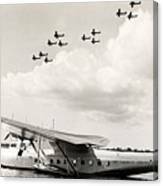 1935 China Clipper In Hawaii by Historic Image - 8.000" x 4.750"
1935 China Clipper In Hawaii poster by Historic Image. Our posters are produced on acid-free papers using archival inks to guarantee that they last a lifetime without fading or loss of color. All posters include a 1" white border around the image to allow for future framing and matting, if desired. 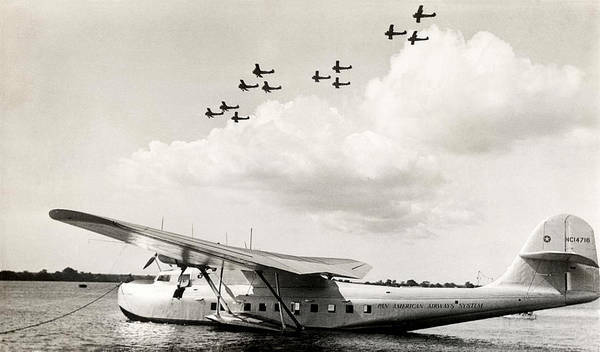 What a great photo from an incredible era of aviation. Featured in Hawaiiana. Aloha. 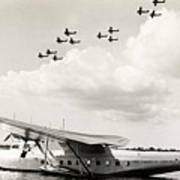 1935 photograph depicting the Martin M-130 China Clipper seaplane moored in Hawaii. A flight of American military aircraft is seen overhead. Hello! long time collector of vintage imagery from photographs to lithographs. 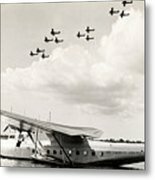 I restore photographs, work with stock photo agencies and POD sites such as Fineartamerica.com. Feel free to contact me through the Fine Art America message system.